Hot dog buns filled with tuna chilli mayo, deep fried to a golden brown and served with ketchup, sriracha sauce and more mayo! I have always wanted to make this but just didn't find the right time to do so. Well, (un)fortunately, we had hot dog buns in the pantry but no dogs (sausages)! So what could I do with six hot dog buns and no dogs? I could make tempura dogs! This was inspired by the "Roti John" I used to buy back in Malaysia at the night markets. 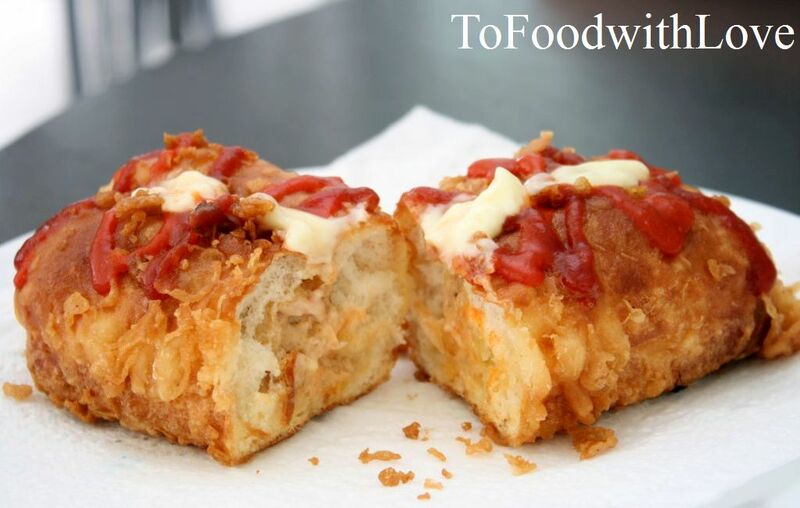 The buns are filled with sardines, lamb, chicken or beef, and then deep fried in batter till crispy and filled with three squirts of chilli sauce from the squeeze bottle. I think I have managed to replicate it pretty successfully here, except that I only had canned tuna in the pantry, so I used that. Mash the tuna and mix it with the mayo and chilli sauce. Season with salt and pepper. Mix the tempura flour with some cold water until you get a slighly runny consistency. Do not overmix. There should be lumps and traces of flour in the batter. Using a serrated knife, slice the buns down the middle without cutting all the way through. Spread a little butter on the inside and fill with tuna. Press lightly to seal the gap, making sure the filling does not leak out. Heat up the oil in a wok on medium-high heat. Roll the bun in the beaten egg, and then coat it with the tempura mixture and drop it into the wok. 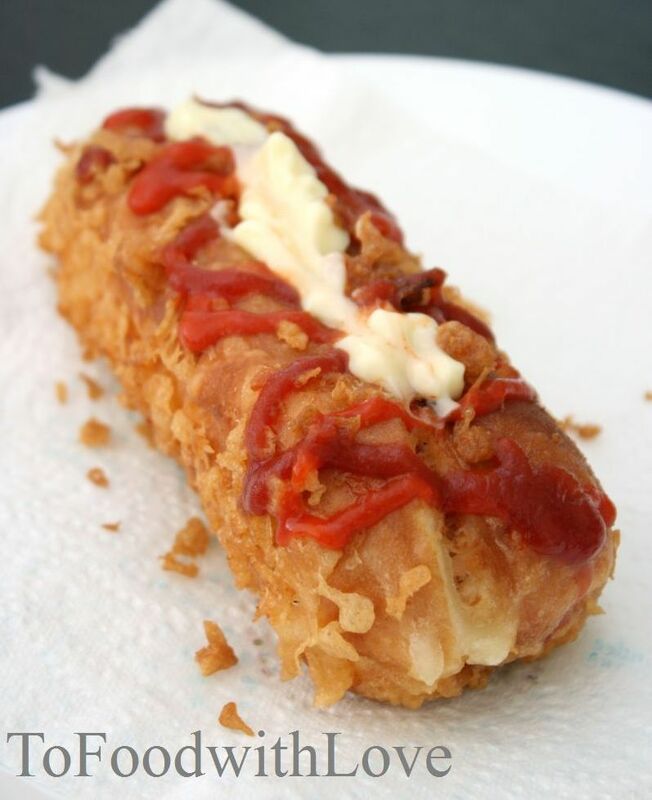 Use a spoon to flick droplets of tempura batter onto and around the bun in the oil. This will give you the crispy tempura bits. Use a spatula/ladle to lift these bits from the oil onto the bun while it is frying. (If shallow frying, use a ladle to bathe the top of the bun with hot oil). Turn the bun on all sides till golden brown and crisp. Drain on kitchen towel. Slice and serve with your favourite sauce. You can vary the filling for the bun. 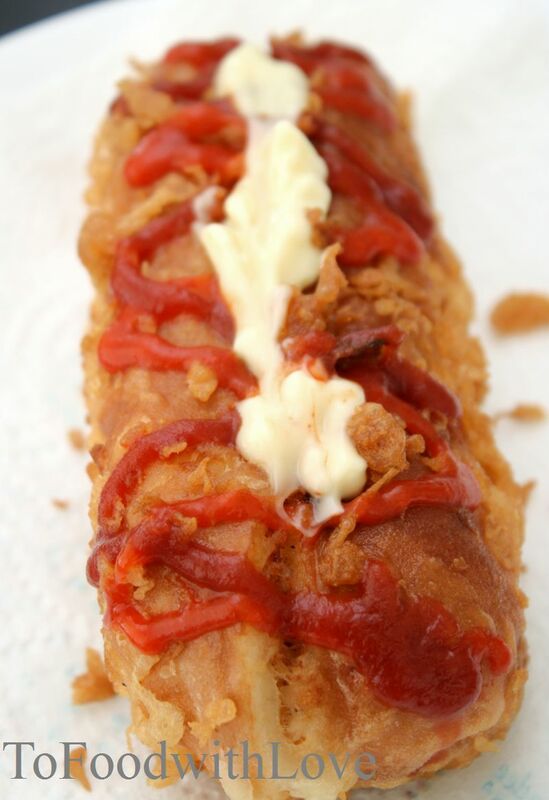 Try it with shredded chicken, minced lamb/beef, canned sardines fried with ketchup, chilli and onion, cheese, and of course, why not a hot dog sausage! Great for lunch or as a snack anytime of the day! Here's a dog with a big crunchy bite!